Education leaders met on 14 Sept to discuss their continued commitment to strengthening initial teacher education, which will lead to higher quality, classroom-ready graduates. 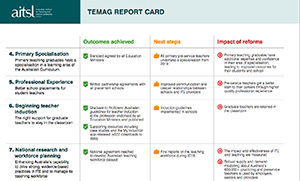 Coinciding with the event was the release of the TEMAG Report Card. The TEMAG Forum held at Parliament House in Canberra - convened by AITSL - brought together some of the most influential decision makers and stakeholders who shape ITE in Australia, including universities, teacher regulators, teacher employers, principals, parent groups and government representatives. “Universities are opening the door to work with regulators and schools to provide the very best in teacher education and to lead contemporary practice. The more universities connect with schools, the more their graduates will be classroom-ready,” AITSL CEO Lisa Rodgers said. “Teachers deserve the very best preparation so that they can be successful from their first day in the classroom." 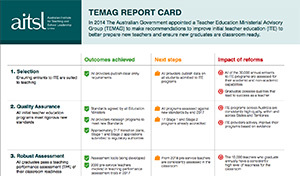 She added, “We saw a stunning example today of what can be achieved when education leaders work constructively and collaboratively, with a shared commitment to lifting the bar on quality teaching.”In February 2015, the Australian Government released its response to the Action Now: Classroom Ready Teachers report from the Teacher Education Ministerial Advisory Group (TEMAG). This response committed to a reform agenda for teacher education that aimed to add rigour to the system and provide a stronger evidence base for ITE in Australia. Throughout 2016 and into 2017 AITSL has continued to implement key aspects of the Government’s response to the TEMAG report. This has included working closely with key stakeholders, such as teacher regulatory authorities and ITE providers, to implement the 2015 Accreditation of initial teacher education programs in Australia: Standards and Procedures.